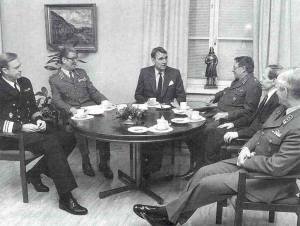 President of Finland Mauno Koivisto meeting with members of the Finnish military junta in 1987. This picture comes from the Finnish Defence Forces website and is most certainly copyrighted. However, it may be freely reproduced provided that the preceding information is provided. The Finnish Defence Forces will use their full military potential against any violators.